Morgan James Fiction, 9781683501619, 332pp. Willow Adair has a picture-perfect life--or so it seems. A stunning model-turned-wife-and-mother, she lives in a beautiful home with her husband and two kids in historic Bexley, one of the wealthiest neighborhoods in Columbus, Ohio. On the outside, she has everything. On the inside, she struggles with issues of self-worth. Spurned by her neglectful husband and at odds with her rebellious teen daughter, Willow never feels she is good enough. She fears everyone she loves will leave. Piece by piece, the cornerstones of Willow's life begin to crumble. A routine colon operation goes horribly wrong. A yoga injury leads to a series of surgeries and misdiagnoses, ultimately ending in permanent loss of motion in her right arm. And then Willow is diagnosed with breast cancer. Convinced that no one will stand by her for one more day of sickness and depression, she prepares to end her life. That's where the Angels come in. Willow's friends lift her spirits when she is sad, and weep with her when she is hurting. They walk beside her quite literally, on sidewalks from Cleveland to Miami. And they walk beside her spiritually and emotionally, soothing her heartache and reminding her that every single minute of her life is abundantly worth living. 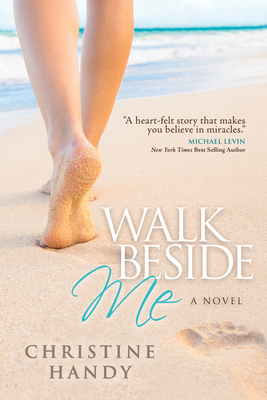 Walk Beside Me is the story of a woman who peels away the layers to find her inner warrior, a woman who faces insurmountable odds and--thanks to her earthly Angels--learns to treasure the gift of God's infinite light and love. Christine Handy is a wife and mother living between Dallas, Texas and Miami, Florida. She has two amazing sons whose devotion through all her illnesses continues to humble and astound her. Christine's family has been a rock, a comfort, and a blessing during hard times. In the immortal words of Princess Diana, "Family is the most important thing in the world."